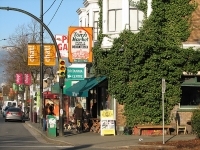 Commercial Drive is as non-commercial as it gets, one of Vancouver's most eclectic and increasingly trendy neighbourhoods. What started out as a skid row for the lumber industry in the late 1800s swiftly became a neighbourhood of English tradesmen and shopkeepers with the birth of the interurban railway. World War I brought an influx of Chinese, Italian, and Eastern European immigrants, and World War II saw a vast increase in the Italian population, earning the drive the moniker of 'Little Italy' for many years. Diversity and energy are still the hallmarks of this area, and an afternoon is well spent exploring its various treasures, from all types of food to chic boutiques, second-hand stores, live music venues, and more. Go ice-skating at the Britannia Community Centre rink or bowling at the Grandview Lanes, enjoy a delicious Italian gelato or espresso, or simply grab a table at one of the many bars or restaurants. There are always plenty of festivals and events going on too, such as the Parade of Lost Souls on the Saturday before Halloween, the Stone Soup Festival in May, and the Eastside Culture Crawl in November.